Cuddle up in one of our fun smiley face fleece onesies! 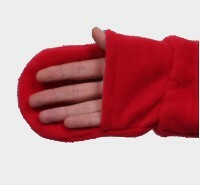 They can be worn as pyjamas or just for lounging about in. 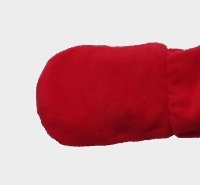 Our anti-pil fleece gives our all-in-ones a lovely, warm, soft feel. Onesies make an excellent alternative to footed pyjamas and dressing gowns. 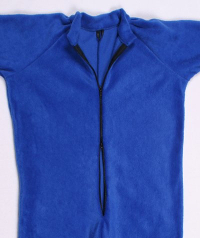 Each fleece onesie comes with a body length front zip to make it easier to put on and take off. Our onesies are loose fitting for comfort and have a matching collar and cuffs. 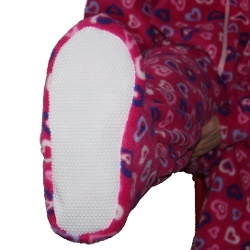 You can choose to add a hood, foldover mittens, feet and Gripper soles to your onesie. Double opening zips have two pullers. One to unzip downwards and the other upwards. Choice of standard length or short (t-shirt) length sleeves. 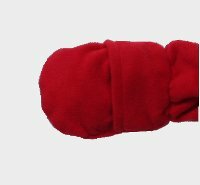 Add a tail in the same colour as your onesie!